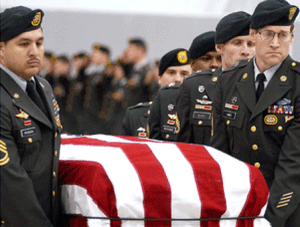 Protecting your Spouse’s VA Accrued Benefits Claim in event you pass away. That’s a great question because, as we all know, large percentages of Veterans die while their claim is pending. Veterans also know how the VA – and a ton of VSOs out there – are in a bad habit of passing on old (or flat out WRONG) information to Veterans and their surviving spouses about Survivor Benefits. My own family has had to deal with the consequences of VA and VSO lies about survivor benefits available to the families of combat veterans that die in – or because of injuries sustained during – combat. So here are a couple things you can do to make sure that your surviving spouse has an easier time pursuing his or her VA accrued Benefits claim. 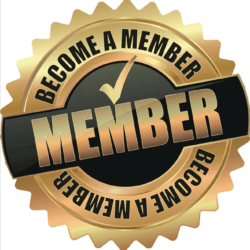 1) Make sure your spouse knows the name and contact information for your accredited VA Benefits attorney. We had one client that never told his wife about us, and when he passed away, we had to hunt her down to tell her she was leaving a huge case on the table. That claim was ultimately worth over $250,000 in past-due benefits to the Surviving Spouse. If you don’t have an attorney in your VA Claim or appeal, then give your spouse a link to this post to get a list of questions he/she can ask an attorney or VSO to find out if they are experienced in VA accrued benefits claims. 2) Make sure your surviving spouse knows to continue your VA claim by filing a Motion to Substitute and a VA Accrued Benefits and DIC Claim. As recently as last month, I talked to a survivor that was told by a National VSO (one of the ones that pays its executives 6 figure salaries) that the surviving spouse is not able to continue her husband’s claim. Seriously, DAV – it’s 2016. Maybe you can send out a memo to educate your team about Survivor Benefits, VA accrued benefits claims, substitution and DIC? 3) Get a copy of your C-File, and make sure your spouse knows where to find it when he/she files the VA Accrued Benefits Claim. How a Veteran argues for service-connected compensation without a C-File is beyond me. 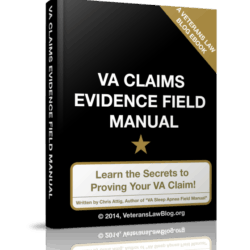 It’s the most important document in your VA claim or appeal. 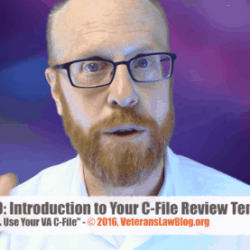 Every Veteran should know the 3 ways to get their VA C-File. Every Veteran should GET their VA C-file. Put it in a safe deposit box, or attach it to your will, or make sure your spouse knows where to find it. 4) Have your spouse talk to the doctor that fills out the death certificate. This is the hardest thing to do – the time of death is often chaotic and emotion filled. However, if one of your service-connected conditions is a contributory cause of death, your spouse can ask the physician who prepares the Death Certificate to indicate that the condition contributed to the cause of death (most death certificates allow space for as many as 3-5 medical conditions that contributed to an individual’s cause of death). If a service-connected condition causes – or contributes to the cause of death – a notation on the Death Certificate is incredibly helpful to the Surviving Spouse pursuing Dependency and Indemnity Compensation (DIC). If a condition which is not yet service-connected (but should be) causes – or contributes to the cause of death – then a notation on the Death Certificate can be helpful if the VA or BVA denies your surviving spouses VA accrued benefits claim. Let me be clear – don’t ask a doctor (or a lawyer) to do something that is not honest. What I am saying is to TALK to the physician who prepares the Death Certificate so that the primary – AND CONTRIBUTORY – causes of death are noted on the Death Certificate. 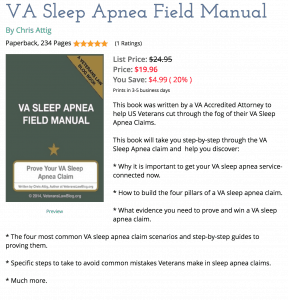 5) Should I get an autopsy for my VA Accrued Benefits claim? This is a question I can’t answer very thoroughly on a blog – we don’t give legal advice on social media platforms. I can only offer some factors for you to consider. Factor A: If you have any desire to KNOW the cause of death – get an autopsy. They are expensive now, yes. But they are even more expensive (and less credible) when you have to exhume a body to get one. Factor C: This is really important – especially if you get an autopsy. We all know how the VA likes to exploit any vagueness or lack of 100% certainty in medical documentation. I know of NO law, rule, or regulation that requires you to give a copy of your spouse’s autopsy to the VA before you have had an attorney and/or a forensic pathology expert review the results. Bottom line – if the VA does not fully adjudicate or complete your claim for VA Benefits while you are alive, your surviving spouse (and in some rare cases, children or parents) may be able to continue your claims and see them through. Follow the above steps to make sure your spouse is armed with the right information to continue to fight for the benefits that you should have received during your lifetime.